We played another Kings of War game at our regular Friday night meeting. This time I played my Vik-orks (or Vik-dorks as one friend calls them) against LeadFool's Kingdom of Men army, at 1000 pts each. 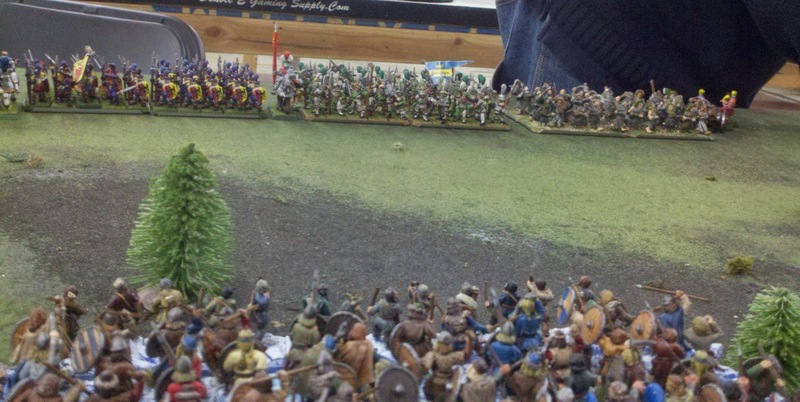 The humans deployed their foot bunched up together in 1 line, with their cannon on my right flank & the characters throughout the line. Here is the view from my Gore Riders on the right flank. On my left, the human general (lead)foolishly rushed forward & found out what 20 dice of Moraxes can do. The general was dead by the 2nd turn. 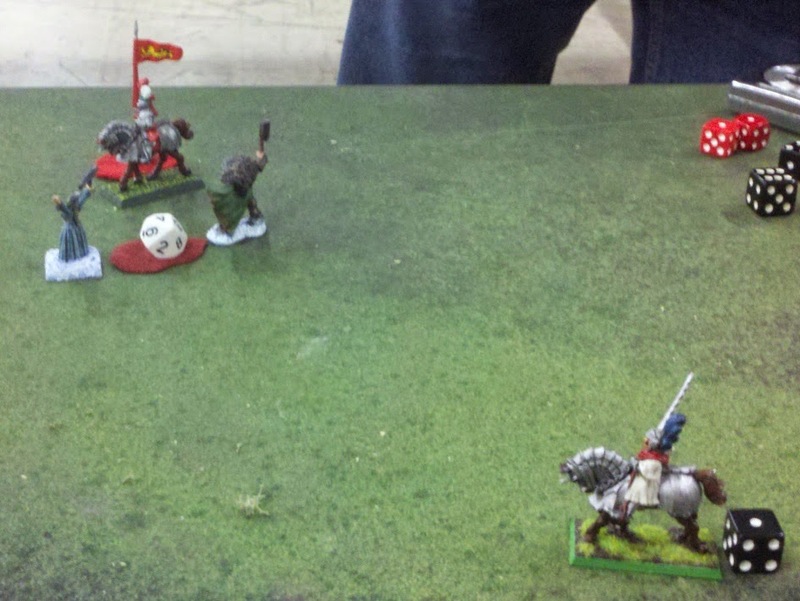 On the right, a big melee developed between my Gore Riders, & their mounted Flagger vs Penitent Mob & their hero. Unfortunately, the humans were the attackers & the Gore Riders got mauled quite significantly, but didn't break. 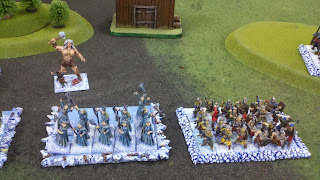 With the Moraxes extended on the left flank, the evil Human Spear Phalanx Horde skulked forward, and my unit got to find out what 30 dice of Spear could do. They immediately flew off to Valhalla. 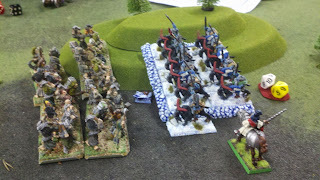 Now that my Gore Riders had distracted the Penitent Mob, my Morax unit on the right flank were able to charge the crazies from behind, rolling 60 dice of hits. The Penitent Mob disappeared, regretting they didn't get to go to Valhalla too. 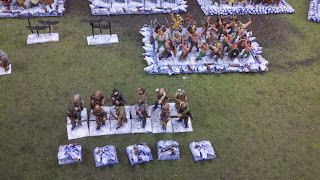 Up until this point, my small archer units that had been screening the Ax Horde, were holding up them up because they kept getting Wavered & couldn't move out of the way. Finally, the Horde had had enough & just ran though them. This unfortunately put them in range of both the Spear Phalanx & Pole Arm Hordes, which both charged them. Luckily the Humans trembled before my MIGHTY HORDE and caused minimal damage. 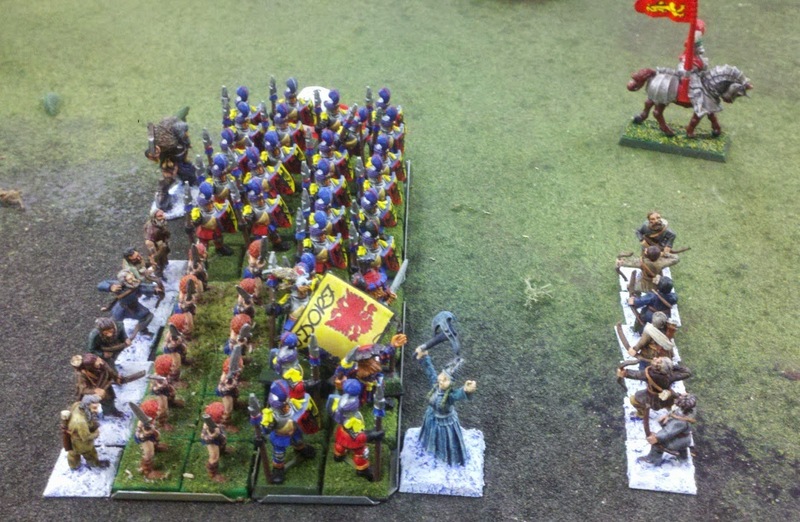 My Morax horde on the right flank had been able to reposition & everyone, including the annoying archers, charged into the fray. 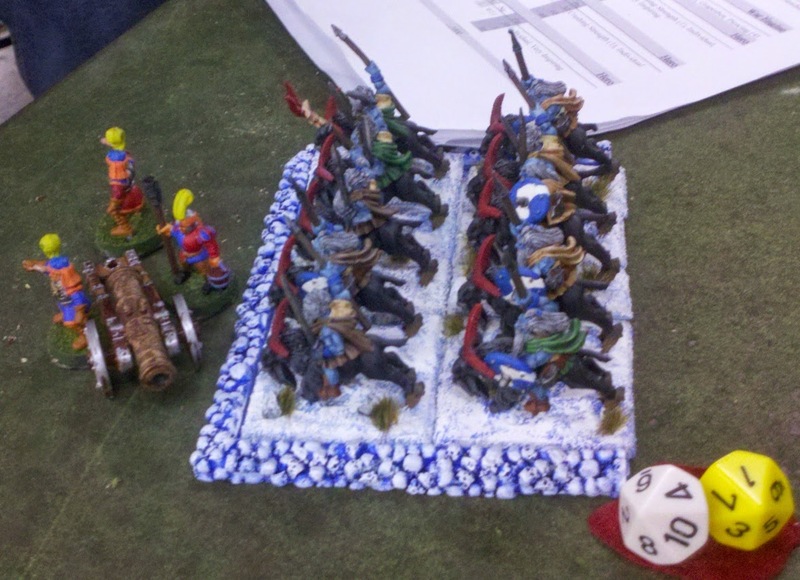 40 Morax dice on the flank took out the Pole Axe Horde. 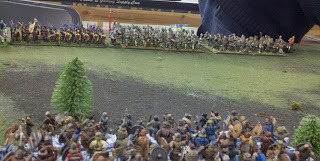 But the Ax Horde wasn't quite as Mighty as 1st thought, and did only moderate damage to the Spears. 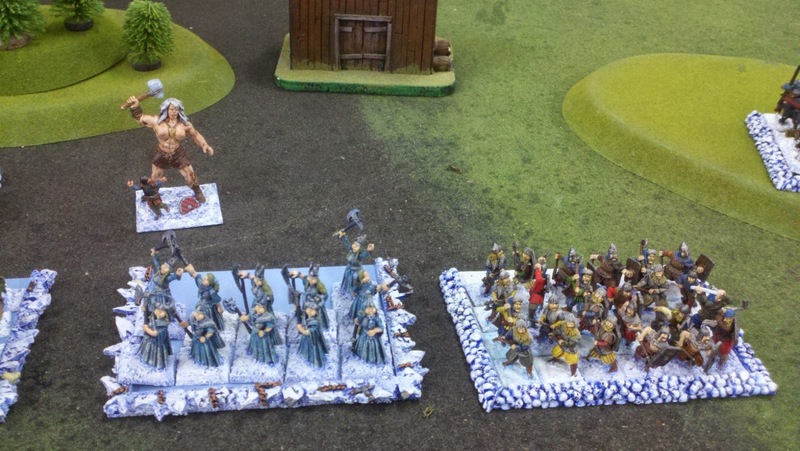 Those evil Spears returned the favor to the Ax Horde & took them out in the next combat. & the Cannon finally found its range, & was able to Grapeshot my remaining Morax unit off to Valhalla too. 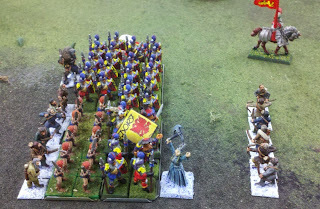 Tricksy Humans: 1 damaged Spear Phalanx Horde, 1 Cannon, 1 Hero, 1 Banner Bearer with Nasty Breath Weapon. 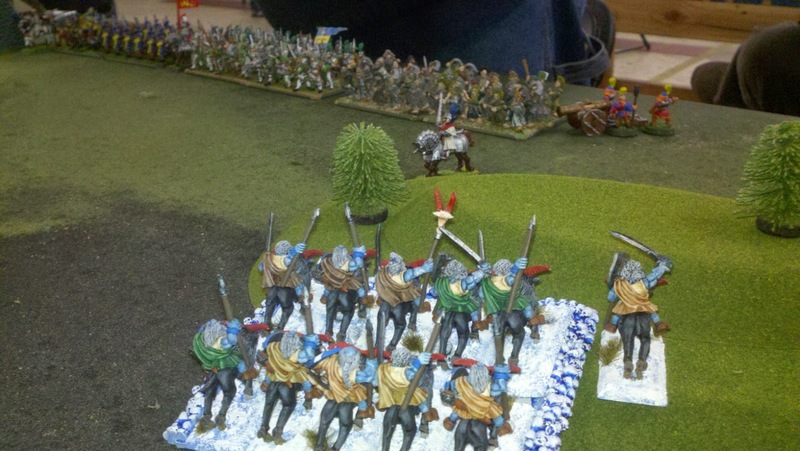 Of course my forces charge in unabated. 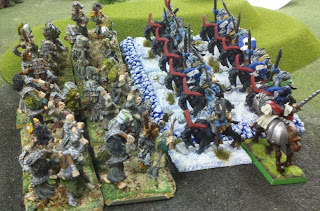 Unfortunately, LeadFool thought units of 5 or smaller figures didn't multiply flank or rear attacks, so wasn't expecting 15 attacks from my archers. The combine attacks finished the Spear off. Finally the Gore Riders, limping along, found a juicy target, and got avenge their comrades deaths & rolled 48 dice against the evil Cannon crew. And it was now that the Standard Bearer with the Nasty Breath Weapon earned his keep. Over the last few turns, he ran back & forth across the field to take out the poor Gore Riders & both of the archer units. So this was how it stood at the end of turn 7. We both only had 2 characters left. 150 pts Vikorks vs 165 pts Humans. The 15 point difference was merely the cost of the horses to mount the Humans. My characters were a complete disappointment, due to both me forgetting their Inspiring rule for the whole game (allowing them to reroll break tests), and all 3 of them together only causing 2 pts of damage the whole game. I think I rolled a 1,1 or 1,2 at least 4 times during the game for either Flagger hit rolls, or break tests for the enemy. I think the MVP of the game was LeadFool's Banner Bearer with the NASTY BREATH WEAPON. The 70 point character took out more than 3 times its points. I'll definitely watch for Human characters whistling & aimlessly roaming the battlefield next time. 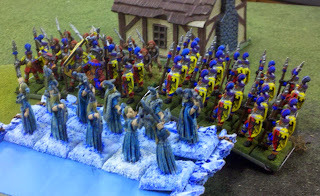 I've been working on a fantasy Viking army for probably over 10 years. 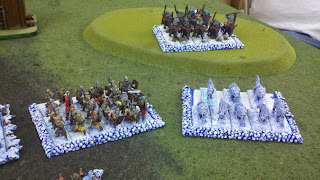 My original intention was to use them as a Beastman army for Warhammer Fantasy Battle. 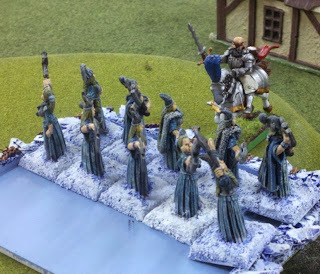 But recently my gaming group has latched on to Kings of War by Mantic Games, which we believe to be a much better army scale fantasy game (at least in terms of the rules). 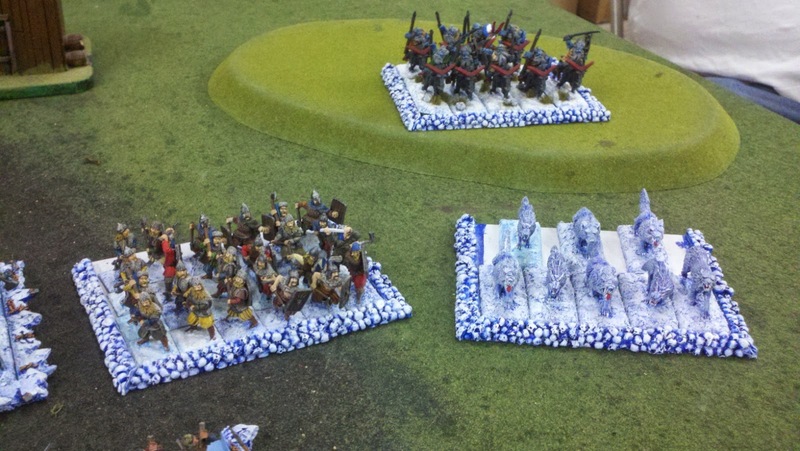 So now I'm running them as the Kings of War Orc list. 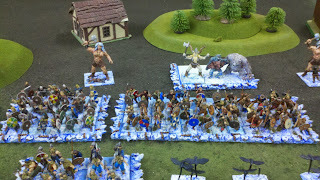 I am now regularly playing with my Vikings for the 1st time. 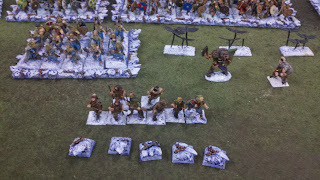 & I was getting a bit embarrassed by the painted figures not being completely based. So over the holiday break, I made a major push to base about 120 figures that were painted, & finish the movement trays I'd bought. Here, in all its glory, is my fully based & trayed Viking army. 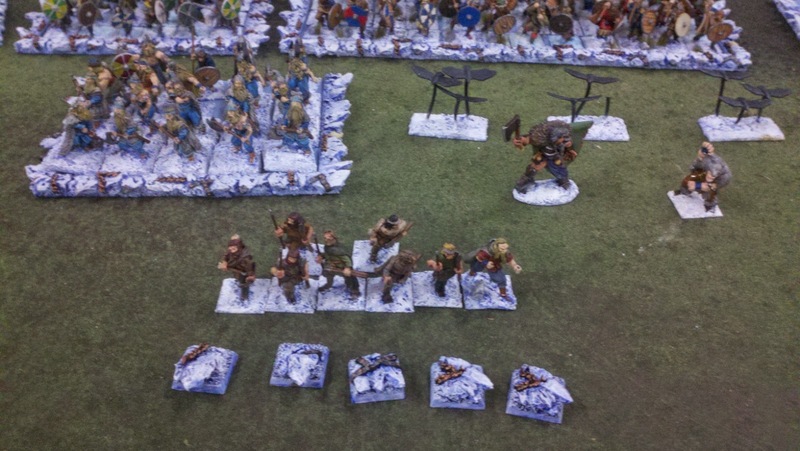 So, that's all my painted figures, completely based & all on movement trays, with 1 tray left over. The whole army comes out to be 2160 points as Kings of War Orcs. 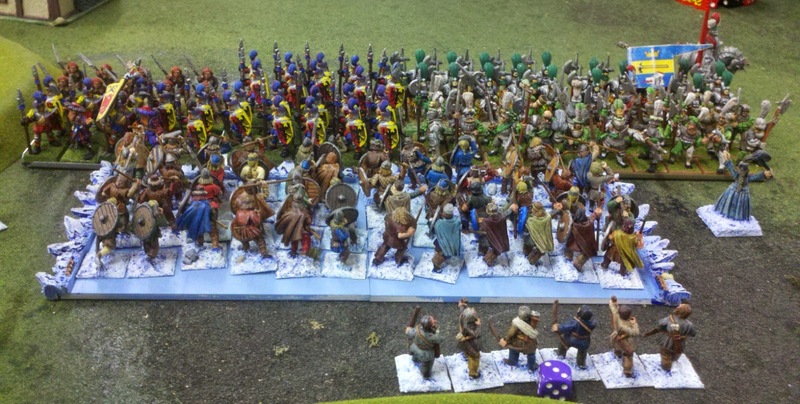 It'd be almost 2500 if I included magic items & turned some of the figures into an appropriate number of heroes & bannermen for this sized force. While this is an awesome accomplishment that I'm very proud of, I have only finished off the already painted figures. 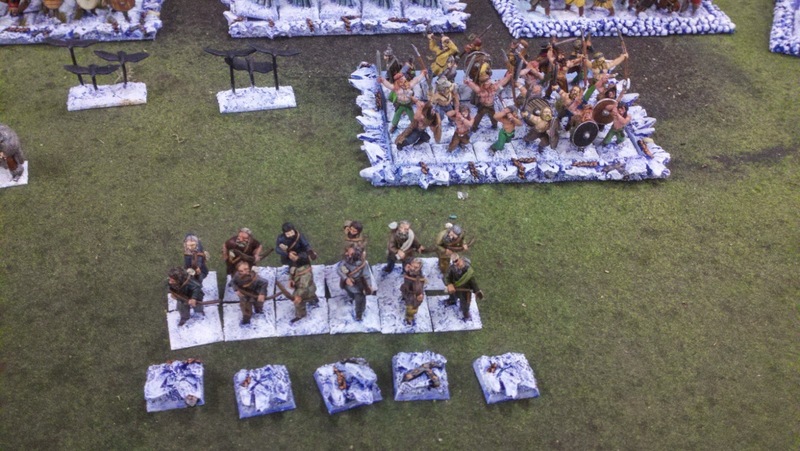 I still have about another 70 infantry, 20 large monsters to use as trolls, 2 more giants, 10 more wolves, plus 3-4 character figures that need to be painted. So maybe I should make that my main project for 2015.